Peljesac is a 65 kilometers long and up to 6 kilometers wide peninsula, located on the east coast of the Adriatic Sea. By its size, Peljsac is second largest peninsula in this part of Adriatic, right after the peninsula of Istra. Peljesac peninsula begins at the port of Ston, which is today known for its beautiful beaches and 7500 meters long wall, which was used to protect the town and saltern, which were very important for the locals. Peljesac peninsula ends at small town Loviste. The peninsula of Peljesac is easily accesible by car, as the roads connecting the peninsula with the mainland are excellent, as well as it is accesible by local and international ferries. The most important is the connection with the main center of Dalmatia, Dubrovnik, which is less than 60 kilometers away from Peljsac. The highest mountain on the peninsula of Peljesac is the St. Ilija, which is 961 meters high. It is accessible on foot, and because of the beautiful surroundings and nature is suitable for short and long walks in nature. Peljesac peninsula is also known for excellent wind conditions, which offers many opportunities for water sports. Every year, lovers of sailing, surfing and kitesurfing are returning there, as in the part of the southern peninsula is frequently blowing maestral wind, which offers good conditions for the water sports. From the Peljesac peninsula is also possible to access the island and the town of Korcula, which is an important center for locals, and also interesting for tourists. For locals, this island is an important administrative and educational center, on the other hand, tourists can visit many historical, natural and cultural attractions on the island of Korcula. There is a wide variety of tourist attractions on the peninsula of Peljsac. It is possible to spend the night in private rooms, or rent an apartment with its own kitchen and bathroom. If you like camping, you can visit one of the many campgrounds. You can also enjoy in hotels, which are not rare on the peninsula. Also, the cusine in this part of Dalmatia will not let you down. Peljesac is known for its excellent wines such as Dingac, which is the most expensive brand of Peljesac, and fish dishes, which should be tasted by every tourist, staying in this beautiful corner of Dalmatia. 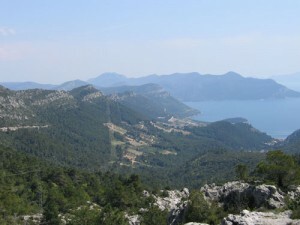 Pelješac peninsula’s main asset is exceptional biodiversity. Pelješac peninsula hide beautiful beaches and bays: Prarprotno, Vučine, Vodice, Lovište, Dingač, Mokalo, Mirce, Divna in Duba. Pelješac is a region well known for its quality wines and winemaking tradition dating back to ancient Greek and Roman times. Famous wine Plavac Mali is grown on characteristic steep slopes of Dingač and Postup. Pelješac is well known for its seashells. Oysters, mussels and other seashells are part of prolific Channel sea life of Pelješac. Viganj and Kućište are well known location among windsurfers fo their ideal conditions for wind and kite surfing. Analyzing rich history of Pelješac one must conclude that all dominant civilizations left their mark on this little piece of Mediterranean: ancient Greeks, Illyrians, Romans, Venice, Republic of Dubrovnik, Austro-Hungarian monarchy.